Right now at Keyes Honda, you can test drive the new 2018 Honda Odyssey. Bring the whole family over to our dealership near Santa Monica, CA to see what the Honda brand’s newest minivan can do. Trust us, you won’t be disappointed. Climb into the cockpit to check out the all-new full-color 7-inch Digital Driver Information Interface and 8-inch Display Audio Touch-Screen. Customize the information interface to display exactly what you want to see, including Honda Sensing® indicators, phone calls, select app controls, and more. The touch screen puts you in control of music, podcasts, and navigation with the touch, pinch, and swipe of your fingers. Is your family burning their device batteries at an astonishing pace? Then they’ll be pleased to find USB ports waiting in the front and rear. Even better? The hassle-free Wire Phone Charger. No adapters, no cords—just drop your compatible device in and watch it come back to life. The Honda Satellite-Linked Navigation System® will help you get where you’re going in your new SUV. Maps feature 3D renderings of buildings, road signs, and terrain. Lane guidance and a live search function are also at your command. The Advanced Rear Entertainment System provides a 10.2-inch display to make viewing easy for 2nd- and 3rd-row passengers. Music and video streaming are on hand to keep everyone rocking out. Speaking of which, wait until you check out the CabinControl™ Social Playlist. This feature lets everyone jump in and help create the perfect playlist by adding a song through the CabinControl app. It definitely improves those long drives. 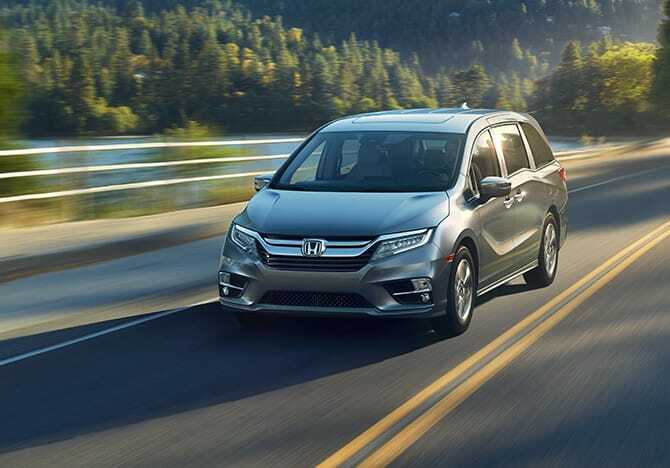 The 2018 Honda Odyssey is just plain fun. Head in now for a test drive. We’ve also got pre-owned Honda Odyssey models on-hand waiting for a new driveway to call home.